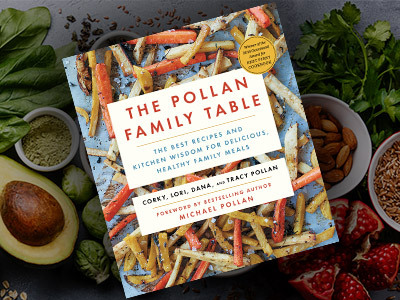 Everyone loves finding a good deal (ESPECIALLY for cookbooks), so of course we couldn’t let this one go by without letting you know: THE POLLAN FAMILY TABLE by Corky, Lori, Dana & Tracy Pollan (with a foreword by Michael Pollan) is on sale in e-book for $3.99 for a limited time! 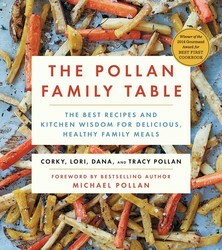 An award-winning cookbook, THE POLLAN FAMILY TABLE is chock-full of recipes like Grand Marnier Citrus Roasted Chicken, Crispy Parmesan Zucchini Chips, and Key Lime Pie with Walnut Oatmeal Crust. In addition to more than 100 of their very best recipes, the Pollans share their favorite cooking tips and techniques, shortcuts, and shopping lists to get you started. Long story short, this book is your answer to Sunday night dinner with the fam, so you’ll definitely be wanting to snag this deal while you still can. Want a taste of what’s inside? Sample recipes for “Hallie’s Mixed Berry Pie” and “Perfect Roast Chicken Dinner in 1 Hour” right here at Tips on Life & Love. This discount is only valid through May 5th. Be sure to download your e-book copy at $3.99 now! Share eBook Deal Alert: Grab The Pollan Family Table for $3.99!